Provide your customers with valuable information increasing trust into your software product. We check your software for the most common best-practices and provide Trustmarks for companies that meet our carefully chosen quality standards. 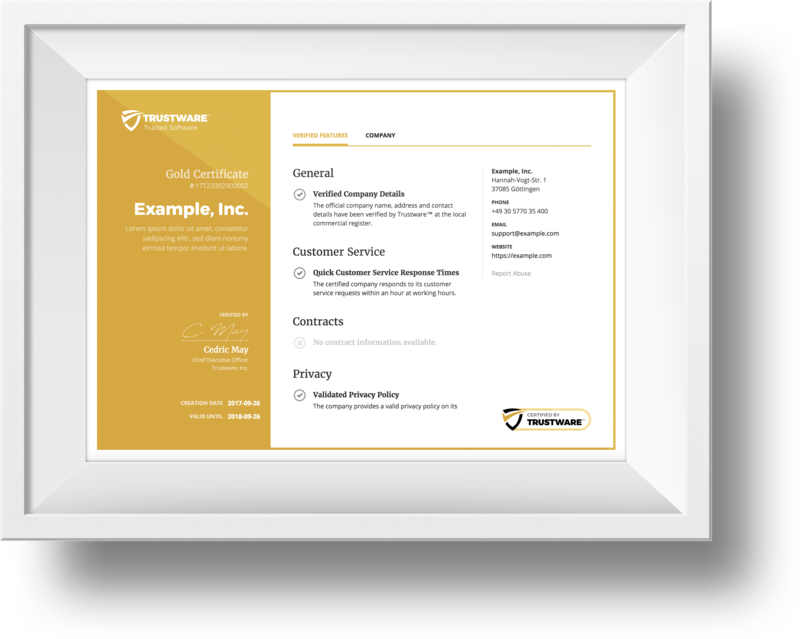 A certification of Trustware® increases the trust of your customers and helps converting leads more effectively into loyal customers. The certification process uses a variety of smart algorithms and APIs to gather needed information. This process only takes a few days and if you're in a hurry there is an express option. The certification process is based on the industries best-practices. We apply them to all applicants in the the same way to ensure a great minimum quality guarantee. The Trustware® Trustmark proves the trustworthiness of your software product. Customers can always validate the connected certificate. Who could better promote your software product then your very own customers? Your customers provide feedback about their experience with your software. The Trustware™ Trustmark proves the trustworthiness of your software product. Customers can always validate the connected certificate. With the Trustware™ Cookie Consent SDK you ensure to respect the latest cookie laws in every country. Still questions? Give us a quick call! ©2011-2017 Trustware, Inc. All rights reserved.